I have some fantastic friends and I'm so glad to have the talented and beautiful Pam Kitty Morning be one of them. 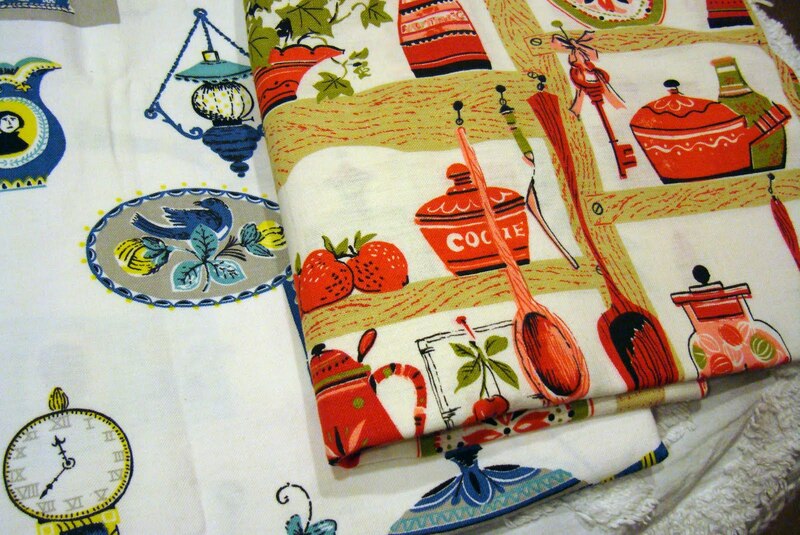 Pam has a new fabric line coming out in the next few weeks. 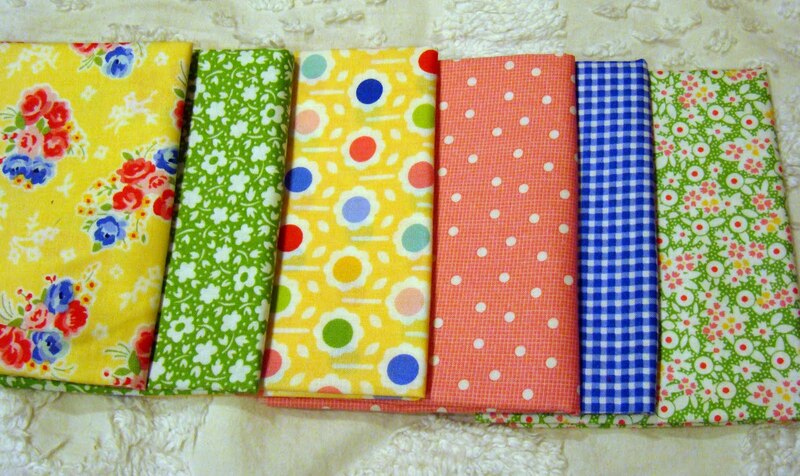 And I'm so incredibly happy to have the much awaited fabric in my sewing studio. I can't wait to use it. 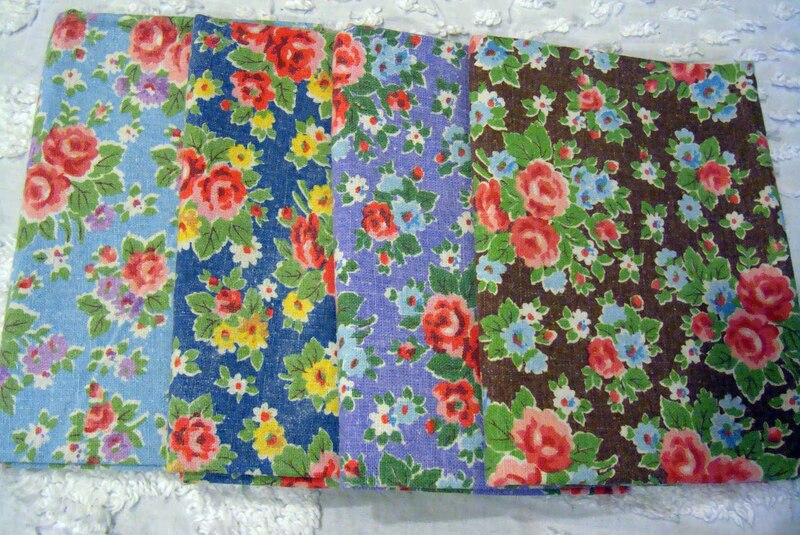 Pam's line of fabric is from LakeHouse Dry Goods. You can go look at the perfect coloration there. 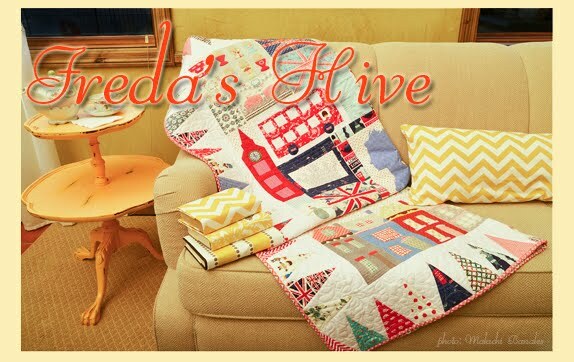 I'm going to show most of the 60+ fabrics in this post today. 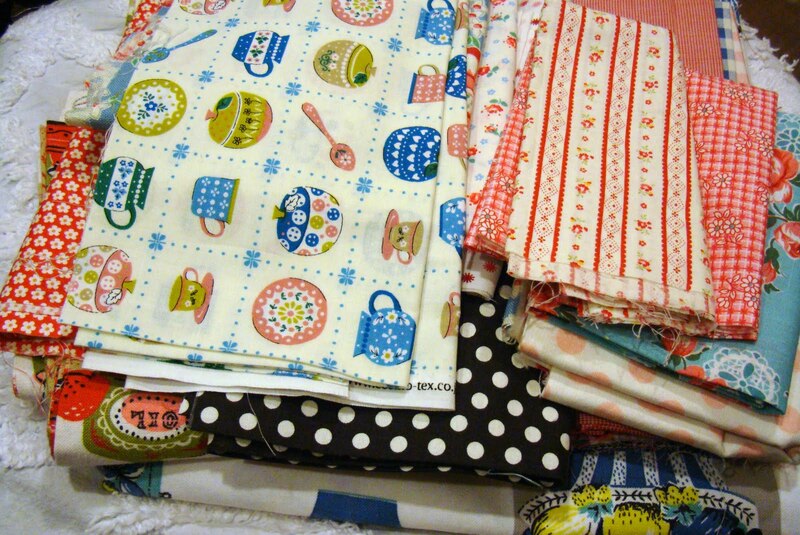 Can you believe there are that many fabrics in this line? And they are top quality yard goods people. Top. 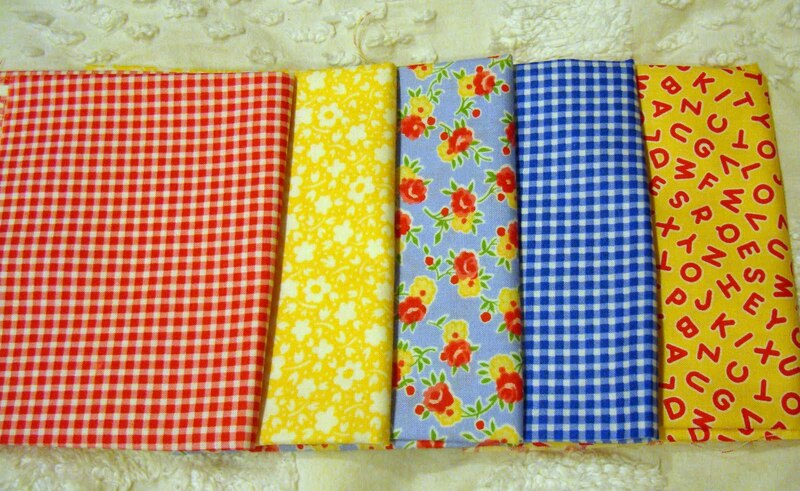 I love to audition fabric. I think this may stem back to the endless hours spent in fabric stores with my mother when I was a little girl, and maybe also back to my Barbie outfit making days. I spent a long time in the studio putting different combinations of Pam's fabric together in small groups of 5 and 6 dreaming of the blocks I can make. 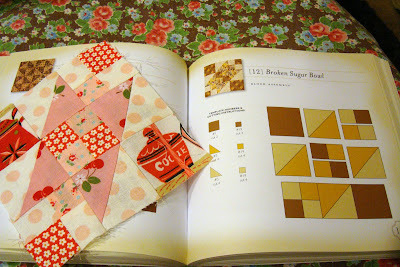 Each time I grouped pieces together I would think "now THAT is my favorite combo". But then I'd play some more and find another grouping of colors and styles I loved equally or even more. Oh gosh, the colors kill. They are really so incredibly pretty. And they go with so much of what I already have on my fabric shelves. The yellows are buttery and the pinks are perfect. The greens are gorgeous. 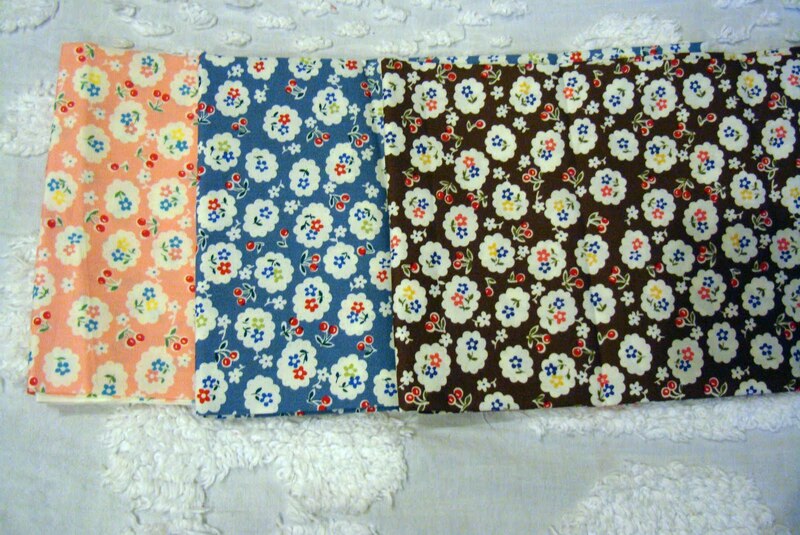 The prints are a hint of vintage with a lot of romance. 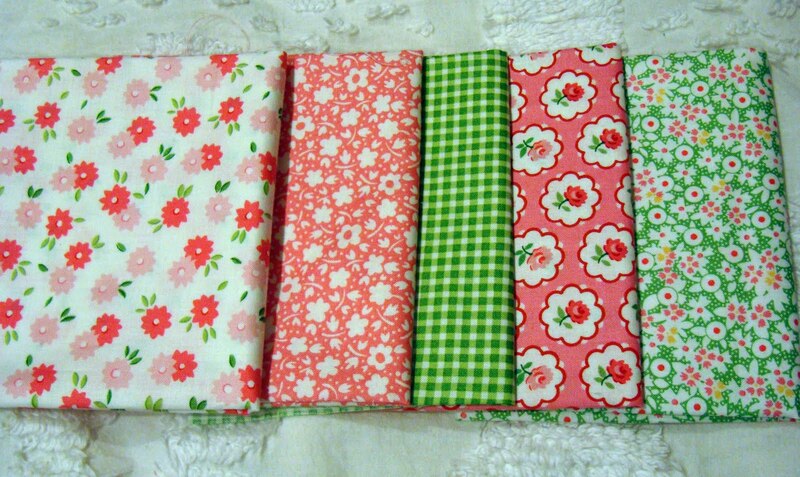 Roses, daisies, dots, gingham...all delicious. My favorite fruit is strawberry and look above - strawberries! 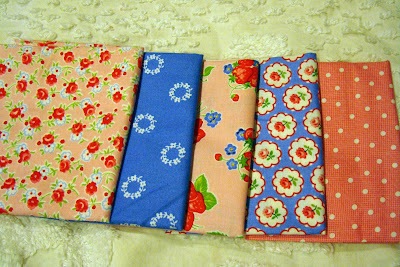 I can tell you my first project will have strawberries in them. I have anticipated Pam's fabric since spring Market. And I've got drawings in my sketch pad just for them. But now I'm like a shy designer. Will what I make show off the prints to their full beauty? The scale is petite and sweet. The selection is vast and full of surprises. I'm pretty impressed with LakeHouse quality and selection. It makes me wonder what Pam might follow this line up with. My photography isn't fantastic so you might look at all the colorways and prints at FQS. I like how they group their fabric together on their website. I had so much fun playing with the colors and prints. 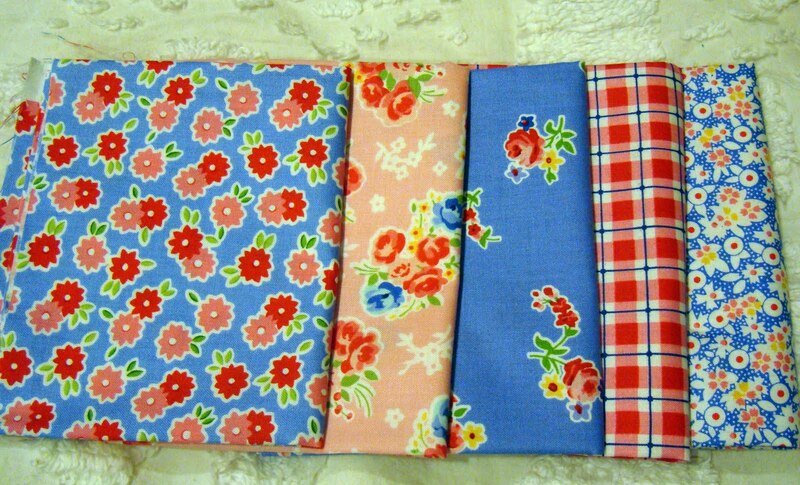 Now I get to cut and sew. 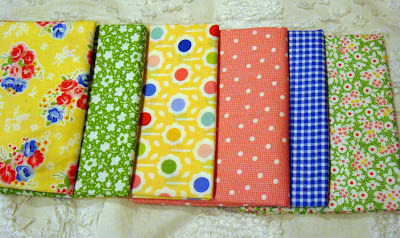 Thanks so much Pam for sending me the fabric. I love it and you've shot it out of the ballpark. You're the best. I want to show you my progress on Farmer's Wife. 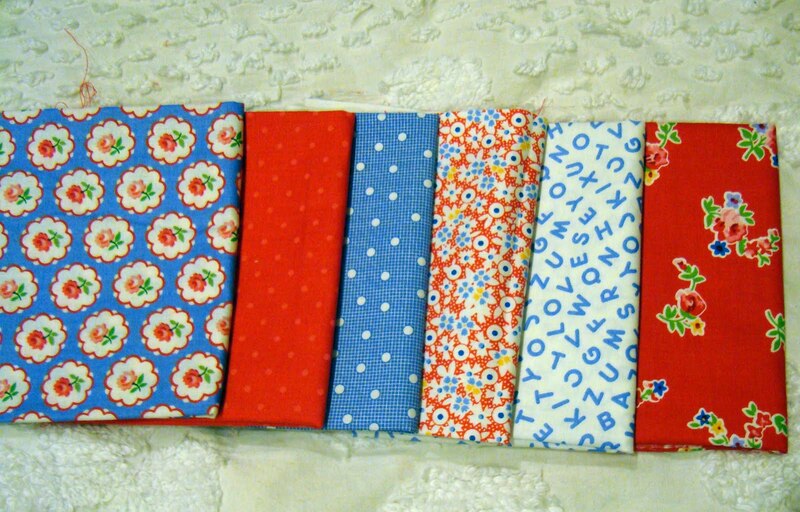 I think what I like most is the creativity I can put into my blocks by matching fabrics together and putting them in the block structure. It really is fun. 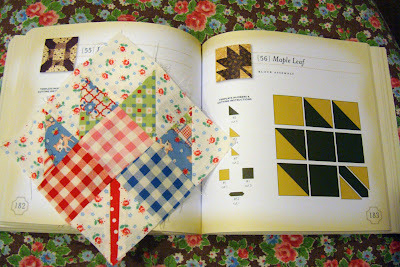 I get quilter's ADD if I have to make the same block over and over. You know what I mean. I also have to thank the girls I met with last week on our sew day and Lori in particular for her tutorials. If you want to start this project you have to go to Lori's blog and use her tips to make the Farmer's Wife blocks. She really has the best way to put this project together. 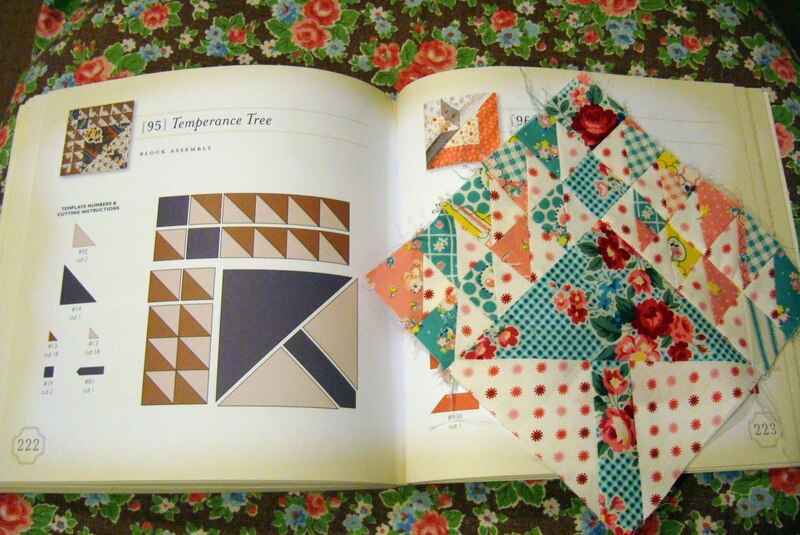 #95 Temperance Tree - There are 2 blocks that look almost the same. And silly me, I think this is the right block. 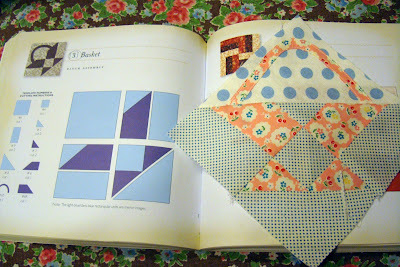 I used Lori's block method to guide my own. This was fun and most of my points are there. Yes I went for the easy blocks first. (lazy me) This one was great to make - #84 Spool. This was my first block I made - #56 Maple Leaf. Again, I used Lori's idea to make it scrappy. 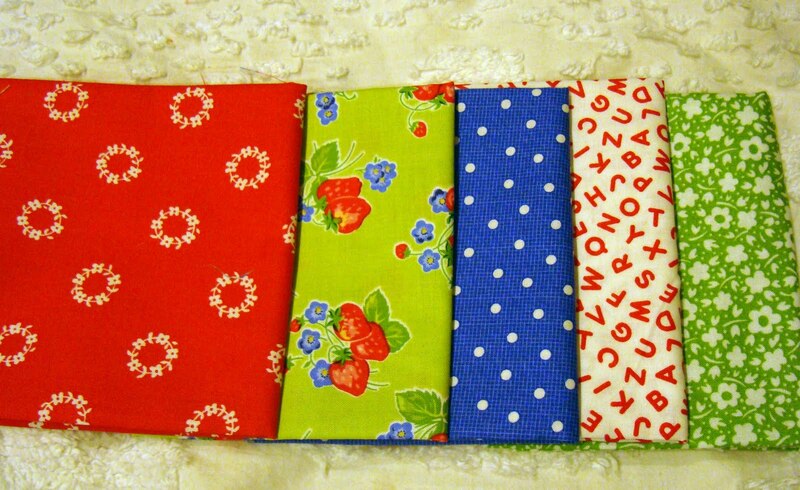 I love the fabrics in the block. 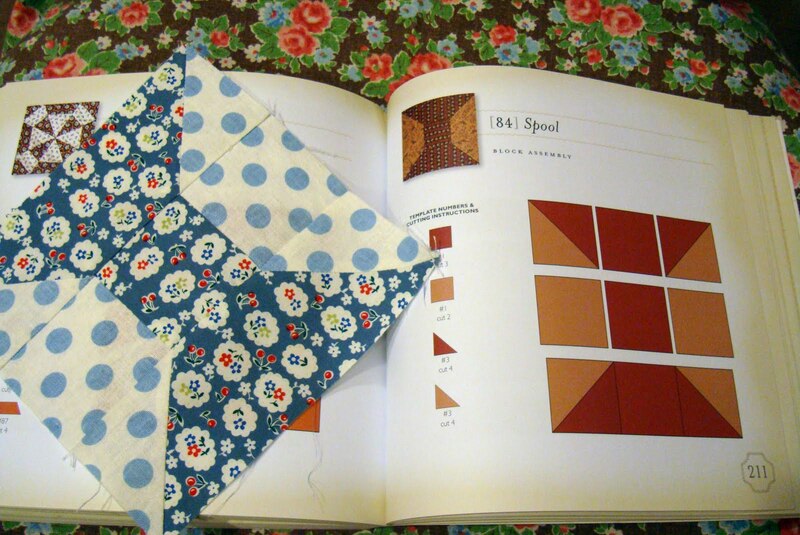 This is a block I made at home, on my own, I might say! It is - #2 Autumn Tints. 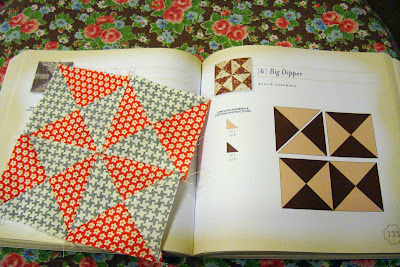 I fussy cut some of my vintage fabric to star in this block. #3 Basket - Well you can see the handle isn't on right. And I made the top part wrong twice. I ran out of fabric so I made it scrappy. I should take the handle off. But I probably won't. Block #4 Basket Weave - I made this at home, too. And I managed to make it 100% right. 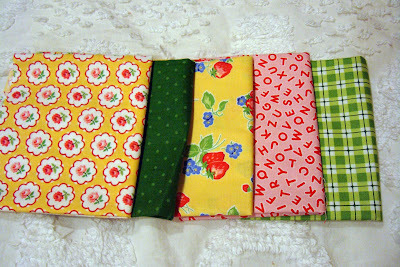 My block is tipped so it doesn't really look like the book block but It is correct, except for the seams being a big off - #6 Big Dipper. Block #1 Attic Windows - and yes this one is not correct. My blue parts kind of blend into the center square and they are pointed backwards or upside down or something. But seriously, no one should really notice. And I'm not out for perfect. I'm out for enjoying the process and being happy with my finished product. 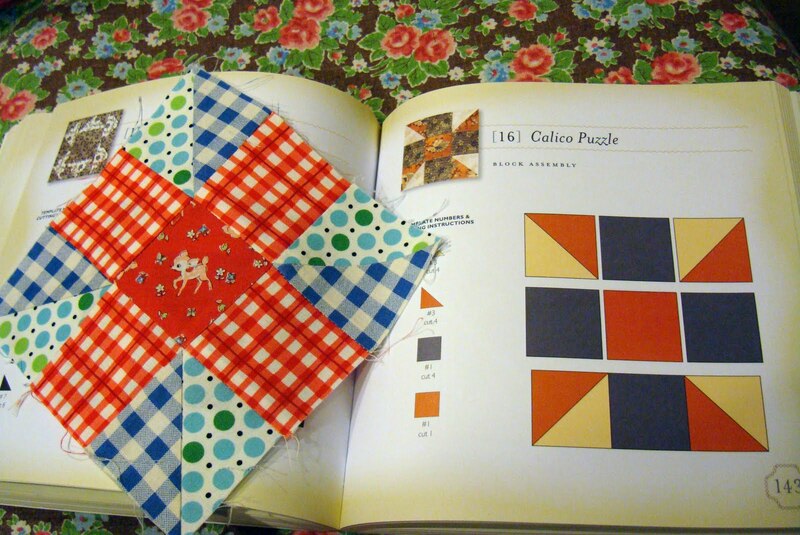 Block #16 Calico Puzzle - I made this at our sew day. It turned out okay. 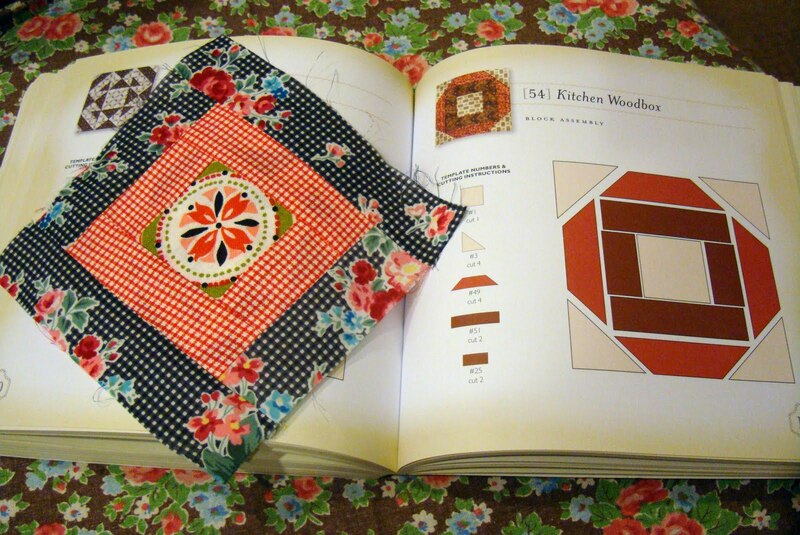 Block #54 Kitchen Woodbox - now this one is not correct. I did not put the end corners and left it really square. 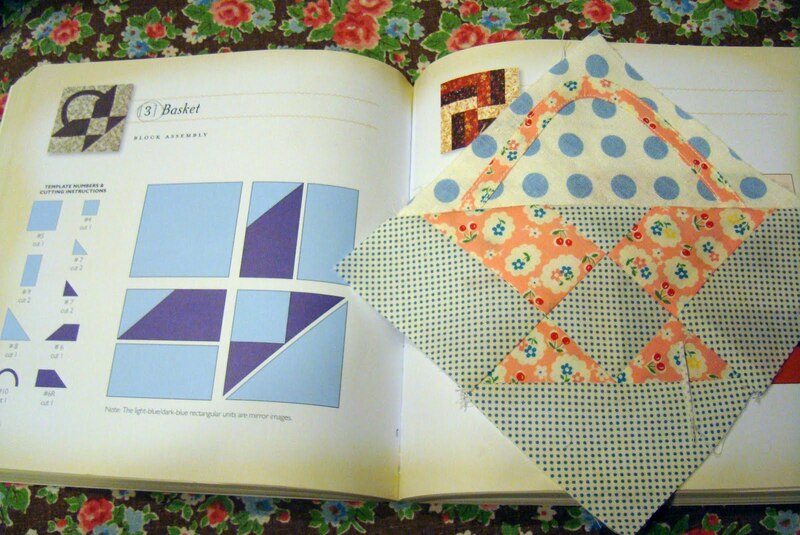 When I made the block at the sew day at RaeAnn's we thought it looked cute just as is, so I skipped the last step. I like a touch of black in a quilt. That center fussy cut makes it kind of look hex signy. Block #81 Snowball - turned out cute I think. 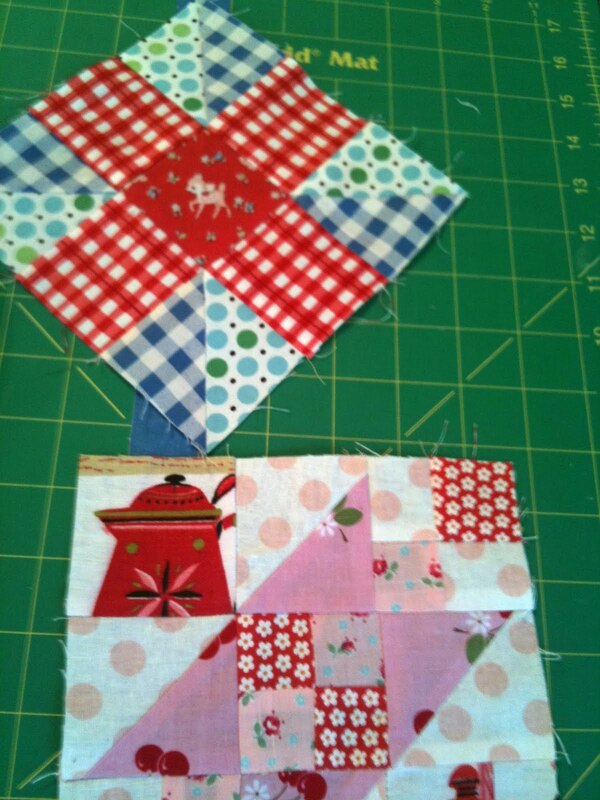 Again, fussy cutting is the heart of this block. I like that. 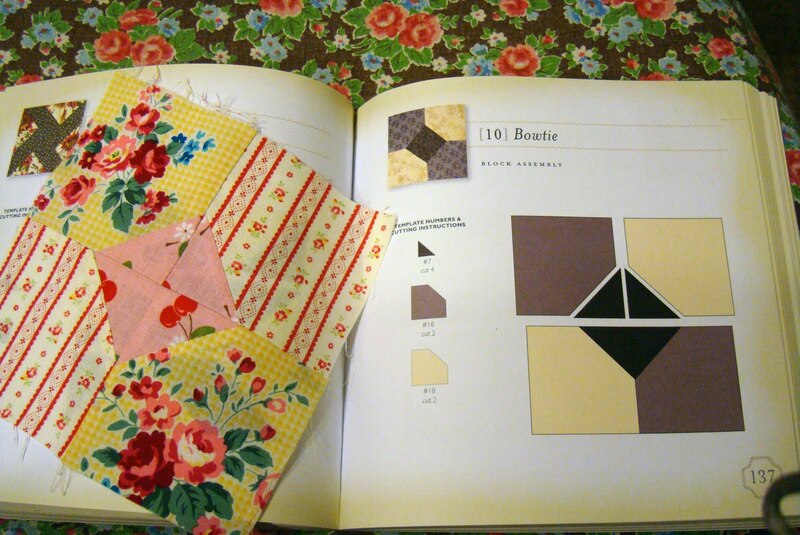 Block #10 Bowtie - super easy and showcases the beautiful fabrics. 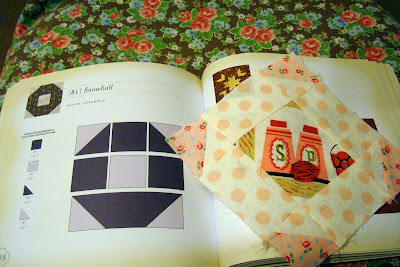 Such fun to make a block like this. I'm on my way here people. I am enjoying this project after all. I have other things on my sewing table and other obligations coming up so I'll work on this when I can and keep showing progress. I'm motivated now but when the hard blocks come on, it may get tough. 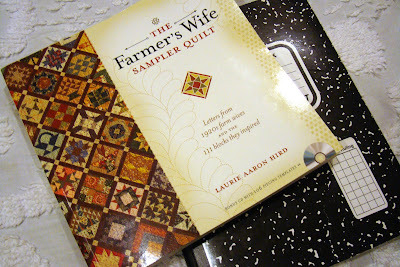 I did cave on my decision to pass on the Farmer's Wife project that is sweeping the quilting nation. I'm very glad I decided to join everyone. 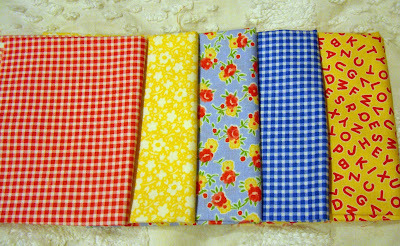 In talking with Lori we decided to organize a sewing day so she could help me get going on my Farmer's Wife quest and we thought we would ask some friends to sew, too. Well it almost didn't happen but we persisted. 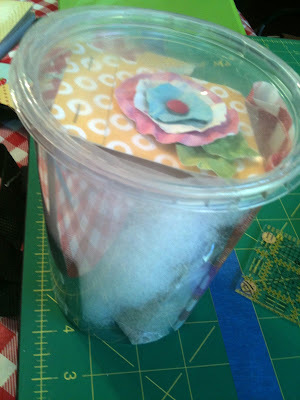 Our sew day was last week. And I took my FW book and trusty grid lined notebook along with me. 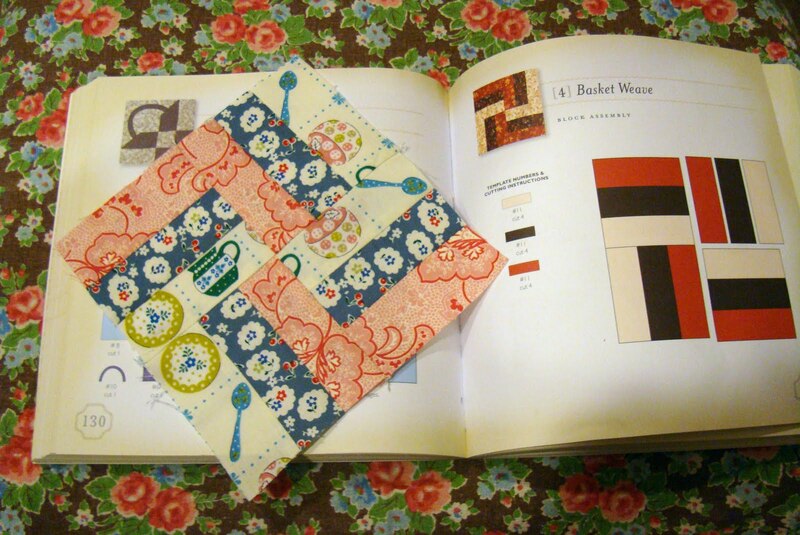 RaeAnn showed me her newly sewn apron (on chair) and her new pattern that she designed and created - a purse quilt. Isn't is so incredible. I love it. We brought some other projects to share. 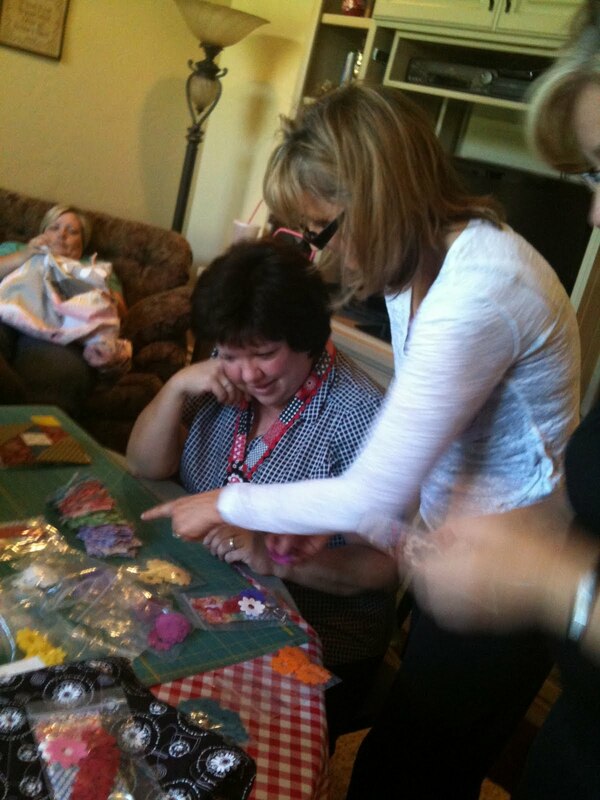 See Lori hard at work on her applique for one of her fall Quilt Market projects sitting in the background. Kim is sitting at the table and pointing is Judi. I think that is Beth with the hands in motion. Not pictured is Paula and Susann. 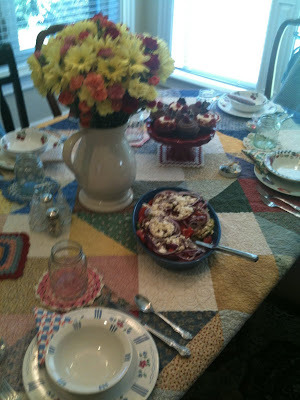 RaeAnn had the table set for our Farmer's Wife theme day. 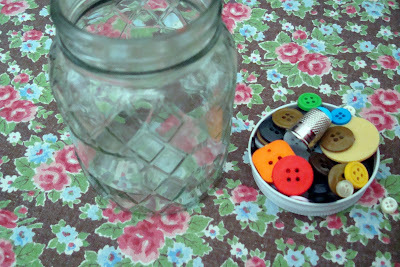 We had fat quarter napkins and drank out of mason jars, which was part of our favor. We laughed, cried, dined and stitched. We had a lovely lunch. 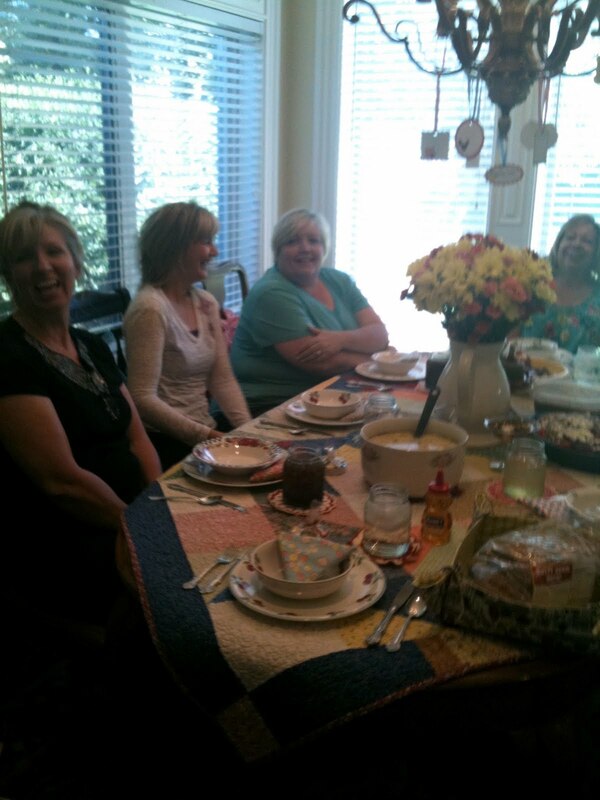 See Beth, Judi, Lori and Susann. RaeAnn had prizes and decorations. She went all out. 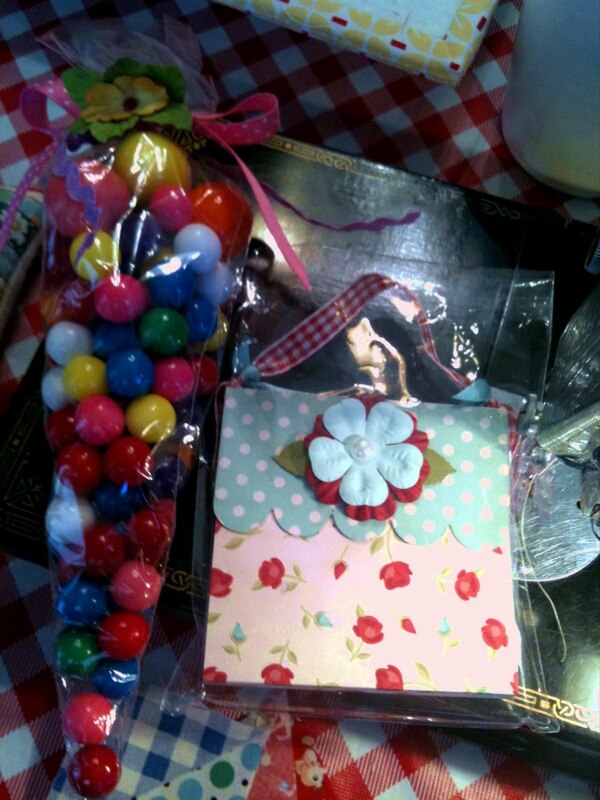 This is my cute prize from Susann. Thanks Susann. I'm hoarding the gumballs. Lori gave us this cute kit in a container. 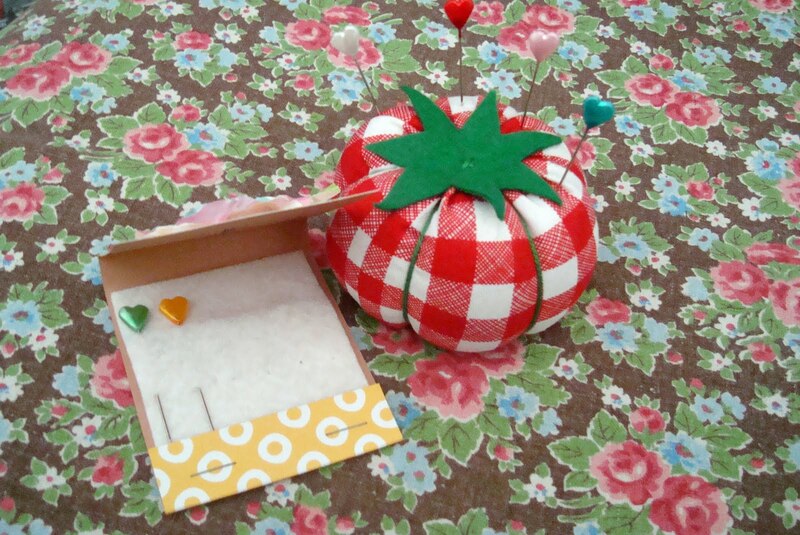 It is for Lori's tomato pincushions. 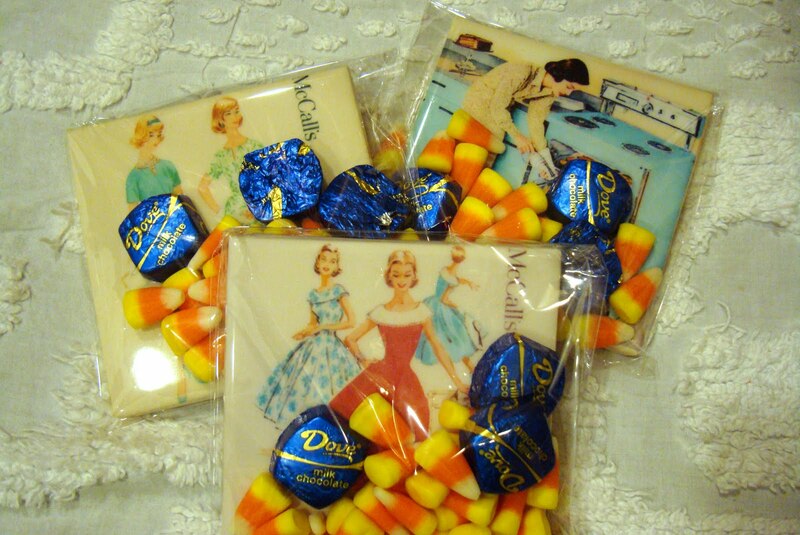 Packaged so cute. Here is my finished product. 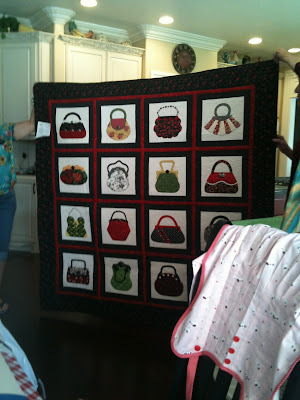 I started it at our sew day and finished it at home. It is darling. She talks about them in THIS blog post. Thanks Lori. I love my tomato. RaeAnn had filled the top lid of the mason jar we drank from at lunch with buttons and a thimble. Genius, huh. Thanks RaeAnn. 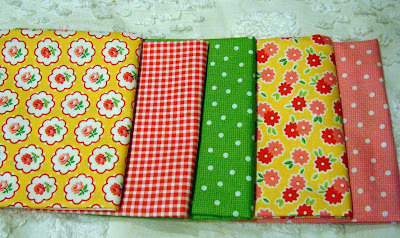 Kim gave us all kits to make her sewing lanyards. The button is magnetized so our pins or needle will stick right where we can get to them and our scissors will be right at hand. I couldn't wait to come home and make up my kit. I've already loved using it. Thanks Kim. Here are 2 of my Farmer's Wife blocks I made during the sew day. I really love using my vintage kitchen and "Nanette" fabrics to make the blocks. It makes the project so much fun. More on those later in the week. 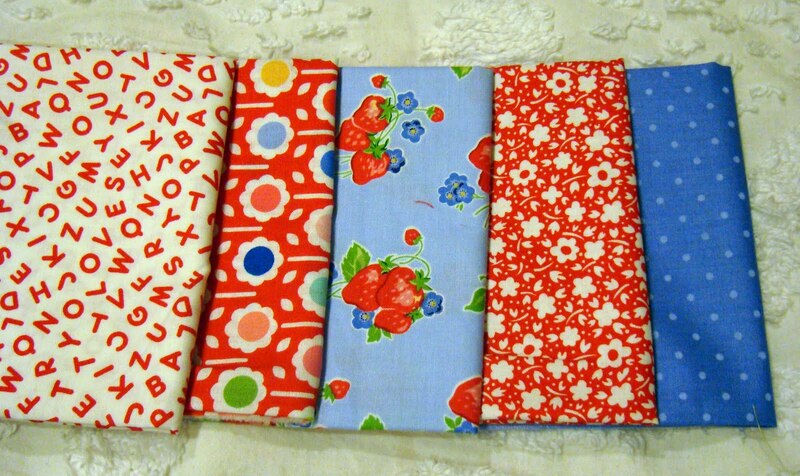 Last Friday I told you I was enjoying fabric in different colorways. Which is kind of a change from my extreme scrappy roots. Today indulge me a bit more as I show you some really pretty florals in different beautiful colors. 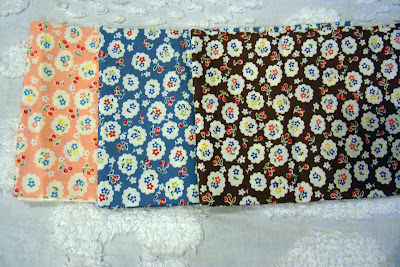 This is a thicker weight cotton/linen blend. But not too thick to use in a quilt. 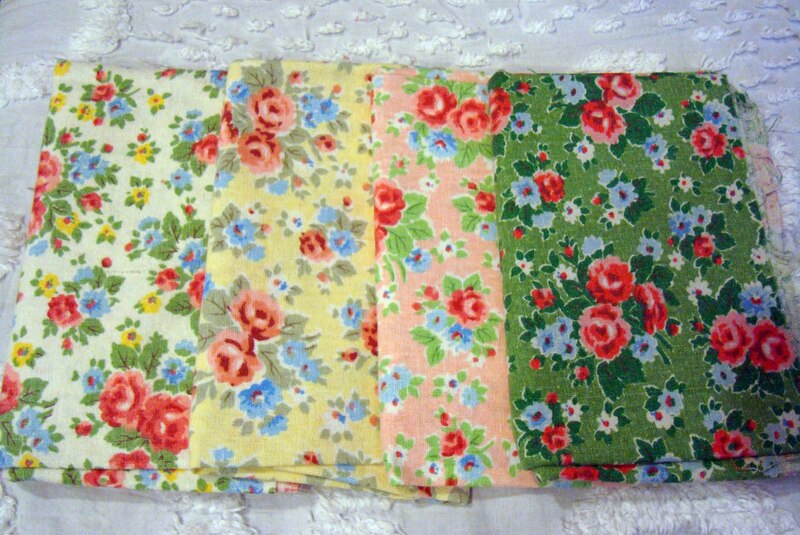 They remind me of a thicker feed sack type fabric. I think the these are just so pretty. 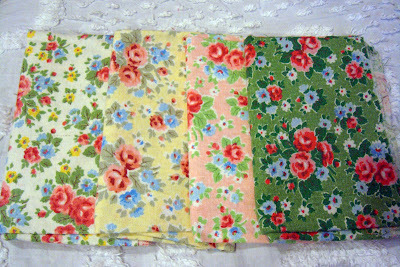 More fabrics in the same prints but different colors. Out of all 7 fabrics, I really think that green is my favorite. 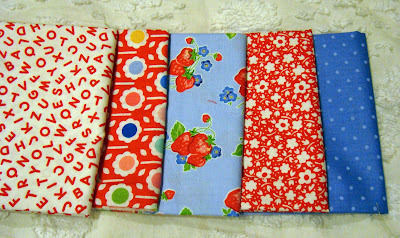 These little cute cherry/florals remind me so much of Pam's new fabric coming out. I have to wait a bit longer for her fabric. So these lovelies will have to comfort me until I can get my hands on Pam's. 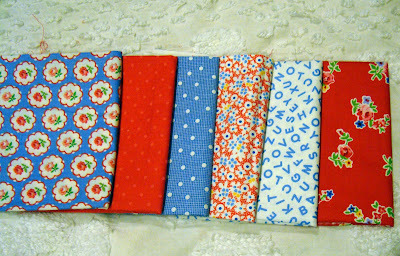 Monday I'll show you pics from my Wednesday friend sew day and my progression of FWQA blocks so far. Today is a play sew day with a few friends at RaeAnn's house. We've been trying to play this for a couple months, at least. You know what it is like to fit everyone's schedule. 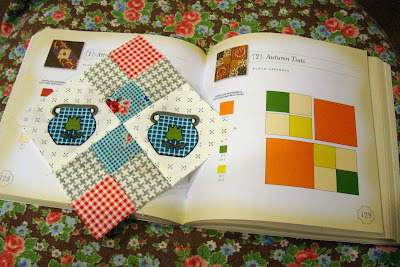 And at one point we weren't sure we could pull it off so close to fall Quilt Market. 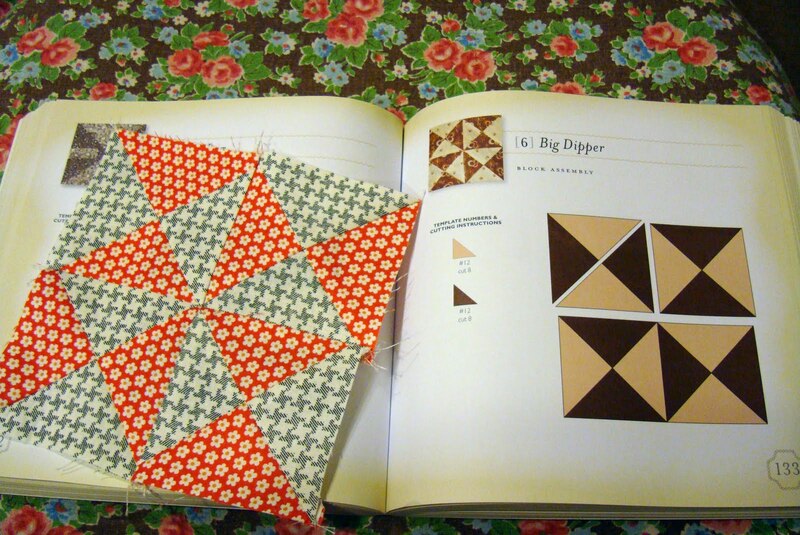 I'm going to be making a few Farmer's Wife blocks. 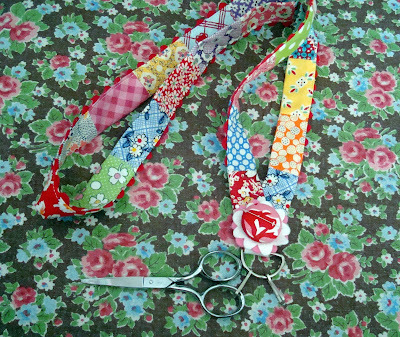 This is just for fun sewing. Lori will be there to help and encourage me. Her tutorials for Farmer's Wife are awesome. 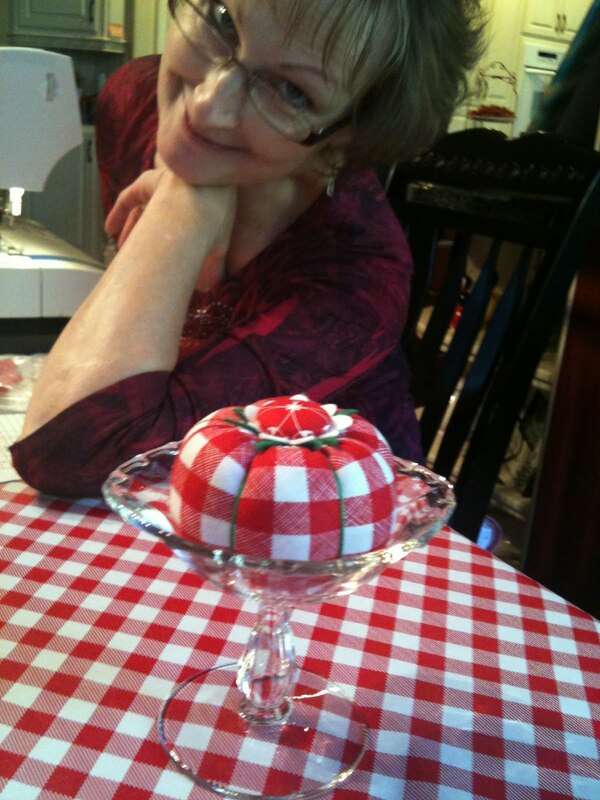 Lori is busy getting ready for market so I'll try not to hog her time. You know we like to exchange little treats for each other. These are my little prizes for my friends. 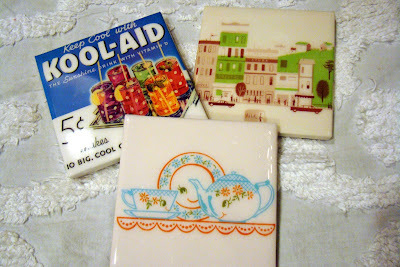 I got these vintage image coasters at Robot Candy's Etsy Shop. 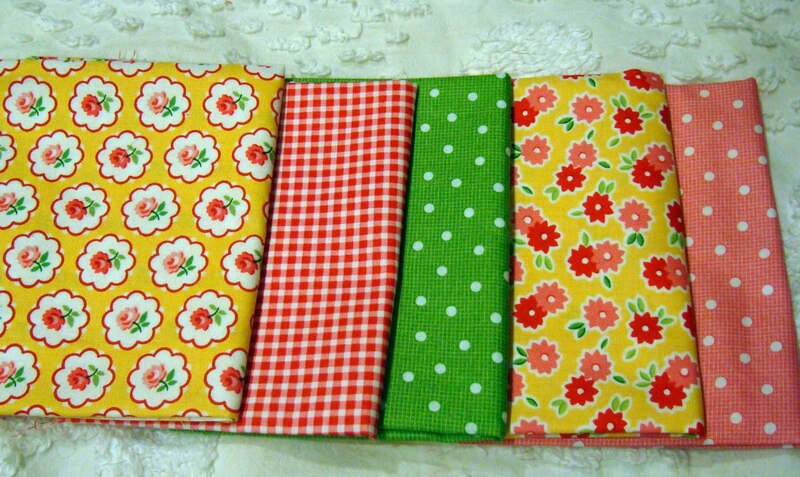 They are heat proof and will brighten up any table. I pulled some fabric to take with me to use for the Farmer's Wife blocks. 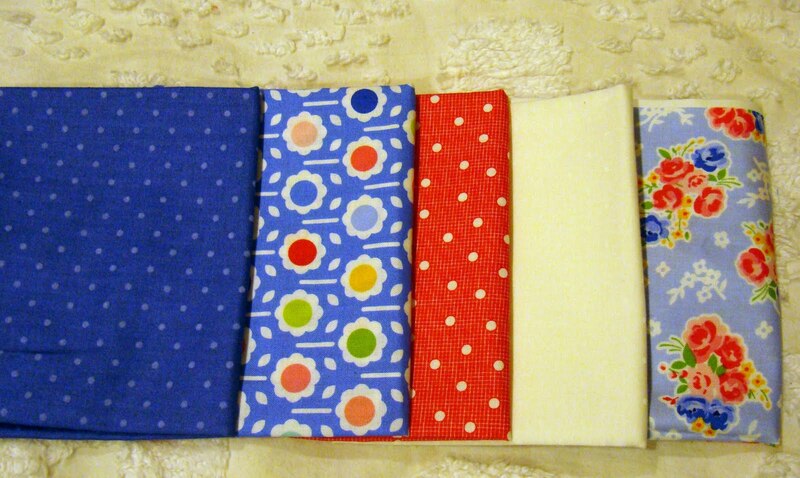 I decided to use fabric that made me super super duper happy. 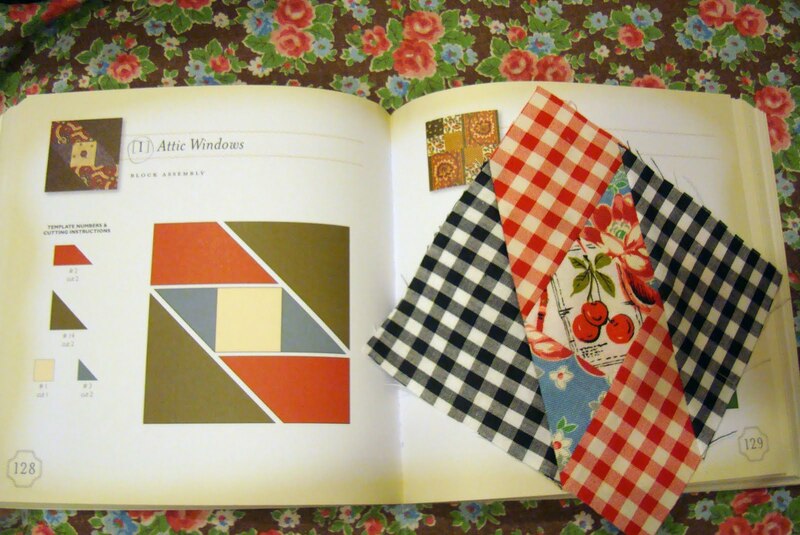 And I decided to use some vintage kitchen fabric. I've been complaining that I haven't played enough lately with my vintage kitchen stash. 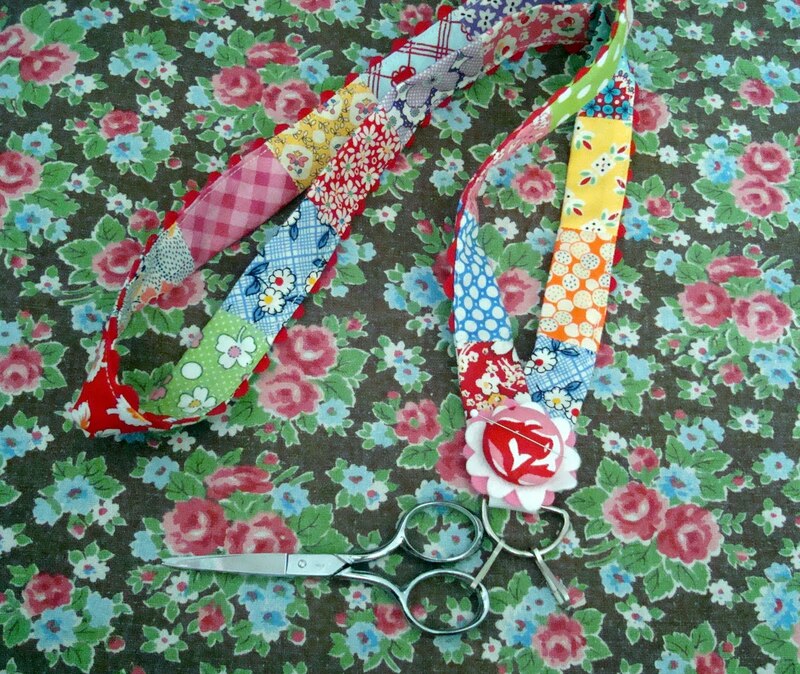 I plan on some fussy cutting, smiling, chatting, sewing, eating and enjoying today. I wish you could all be there. 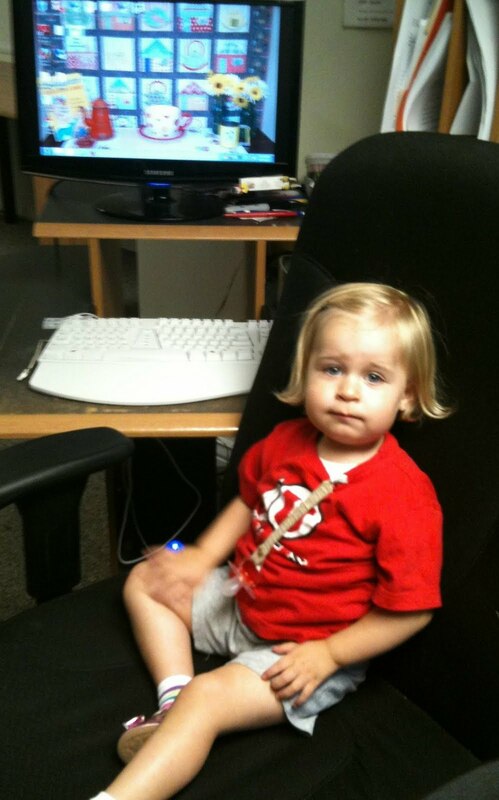 We had my granddaughter Allison from Thurs-Sunday. She was so much fun but so busy, too. It is nice to have help from some of my kids and husband. I have to say I don't know how I raised 8. Saturday I had a few things to do at work so I took Allison with me. Here she is sitting primly at my desk. The expression on her face makes me laugh. 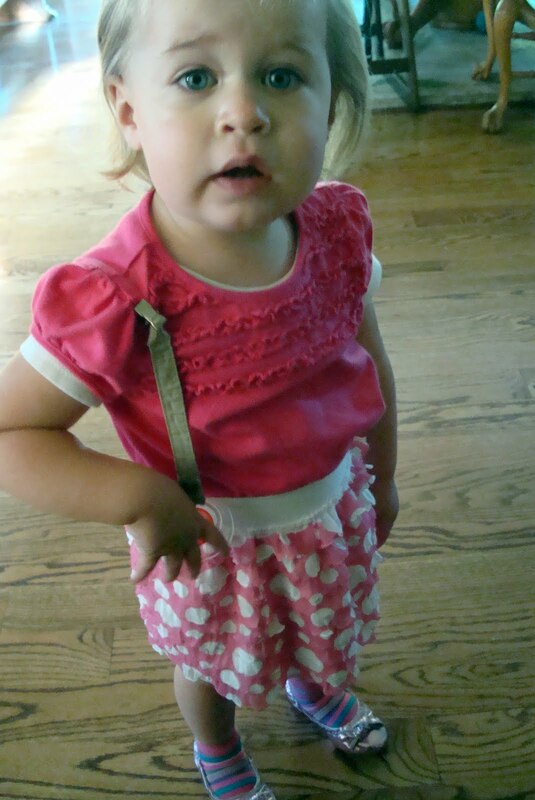 The only thing I got done in 4 days was this little skirt I made for Allison. 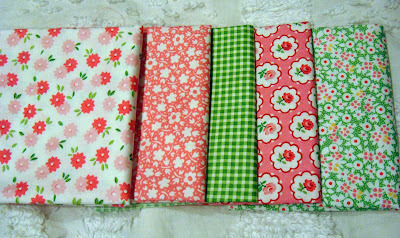 Shelbie and I purchased the ruffle fabric when we were at quilt market in May. 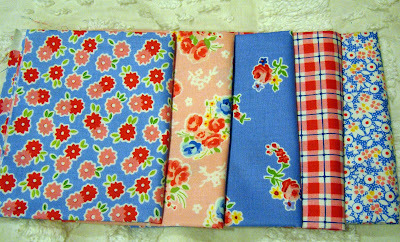 It is sold online, too, at the ruffle fabric website. The skirt was so easy. I measured how long I needed it on Allison and cut it 32" wide. Then I gathered the top and used my double needle to stitch the fabric to the elastic waistband. After that there was just one seam down the back. No hemming. Imagine that. 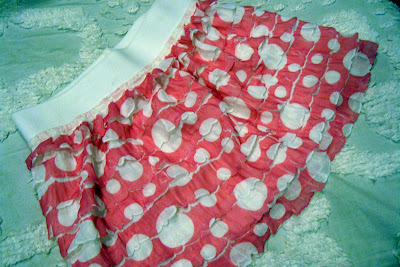 I have a few different colors of the ruffle fabric. I think little pants for Allison made from ruffle fabric would be cute. I may have to do that next time. This is usually my view of Allison since as a nearly 2 year old she seems to have unlimited energy. 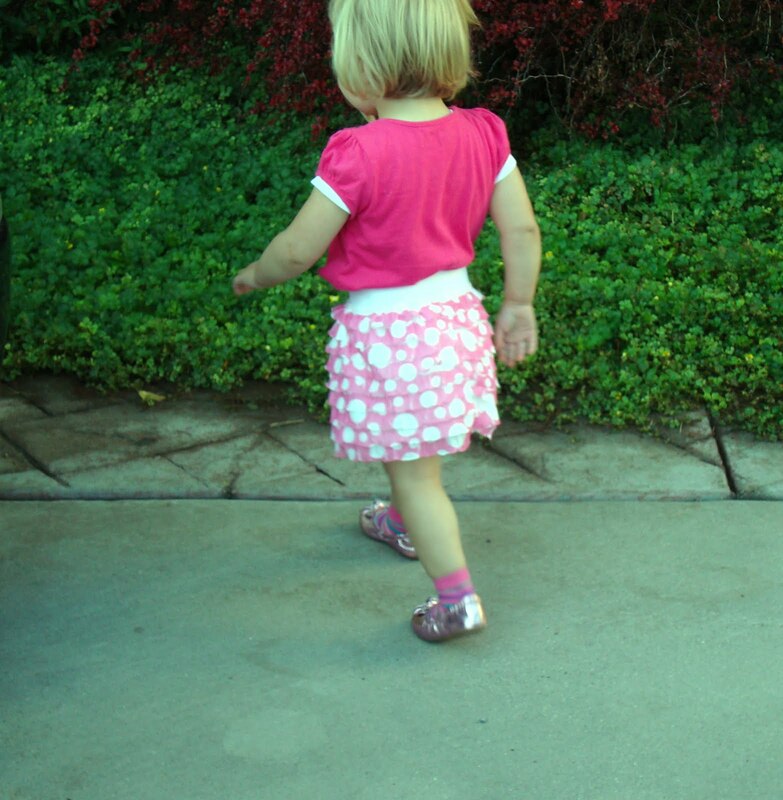 We took her to church with us in her little skirt. That was something!